Annie O’Neil is pleased to announce that her new film Phil’s Camino will be screening as part of the SF DocFest this coming Saturday and Monday at Roxie Theatre in San Francisco. You can purchase film screening tickets here. Looking across the bay from Albany Beach. Photo courtesy of Guy Joaquin. Join us for this full-day walk that starts at the Richmond BART station, follows the scenic SF Bay shoreline, winds through the charming neighborhoods of Berkeley, and ends at the Rockridge BART station in Oakland. It’s a chance to walk a large part of the East Bay that we often just whiz by in our cars, and discover hidden gems along the way. If you’re training for the Camino, this is a chance to try a longer-distance walk alongside experienced pilgrims. And it’s easily accessible using BART! Park at the Richmond station and take the train back from Rockridge at the end of the walk OR park at the Rockridge station and take the train to Richmond to start the walk (Fare: $2.70 one-way, free weekend parking at both stations). From the Richmond BART station, we’ll walk down to the Richmond Marina and join the Bay Trail through Point Isabel (ruff, ruff!) and the Albany Bulb to check out the remaining urban artwork. At University Avenue in Berkeley, we’ll head up into downtown via Addison Street and then through campus before strolling down College Avenue to the Rockridge neighborhood. Canine Pilgrims: Dogs are welcome, too! But please bear in mind that this is a long, “thru” walk and carefully consider your dog’s capabilities. Public transportation policies are basically prohibitive for our situation (BART and AC Transit require pets to be in a container). Taxi, Uber, Lyft cars, etc. may/may not accept pets. So we’re recommending this as a “circuit” walk. Park and meet us at Mudpuppy’s Café for lunch and then walk a section (e.g., to the Albany Bulb) and return back on your own. Otherwise, please have someone with a car on call to pick up, if needed, or at the end. RSVP by Friday, June 10 by emailing Guy Joaquin (walk leader) or the Facebook event. Email any questions, too. Please let us know if others will be joining you and if you plan to use one of the “drop in” or “drop out” points. “Drop In” Walkers: Also include your mobile number so you and Guy can keep in touch on timing and location on the day of the walk. Location and details will be sent to NorCal APOC chapter members by Rennie Archibald in the next few weeks. More details on our Facebook Group and NorCal Chapter page. I’m back from my Camino! 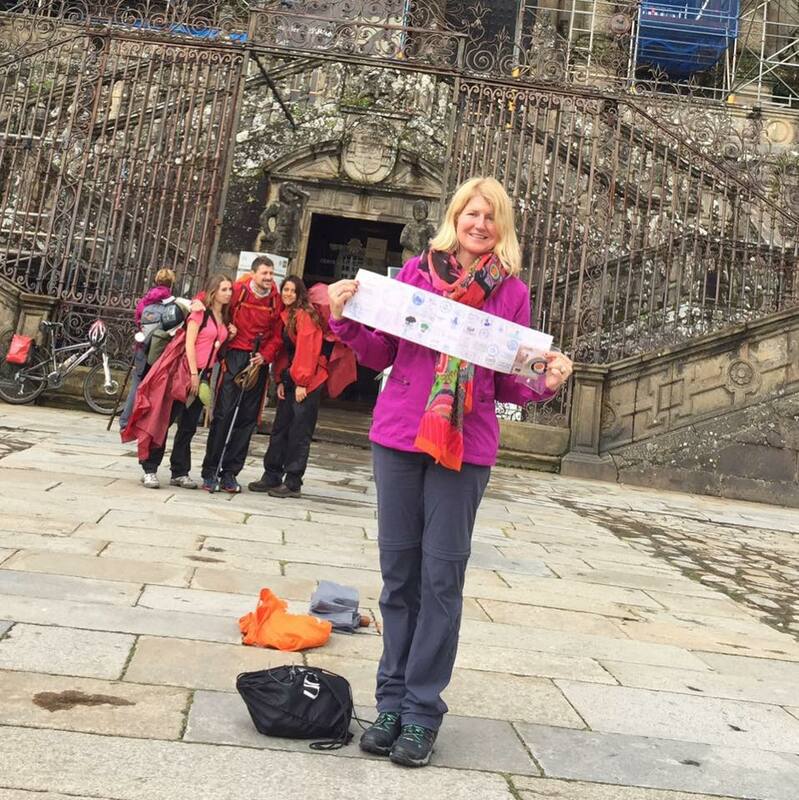 I enjoyed a Trafalgar tour of Portugal with my mom, then I walked 150 kilometers of the Camino Portugués May 21-29 from Ponte de Lima, Portugal. I took many photos and will be sharing my experience on this blog soon. It was truly an amazing experience. Here’s a photo of me in Santiago. My credential full of stamps and memories of places I stopped at along the Camino. 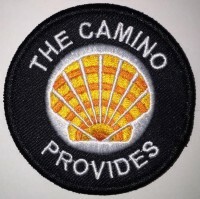 I designed a new 2016 Camino Provides patch for those who wish to commemorate their 2016 Camino. This variation has a western theme and shell colors represent a sunset. The shell points the way along the Camino and reminds us to keep moving forward in life. Ultreia! Click for more details. To order this new patch, write “2016” in the order notes. You can mix and match patches, just note the quantity of each. Order individual patches, or buy a dozen, get one free. Why the patches? I am not selling these for profit, rather, I’m doing this just to make my blog sustainable. There are costs to maintain my blog, so I partner with like-minded sponsors who have something of value to share with other Camino enthusiasts. 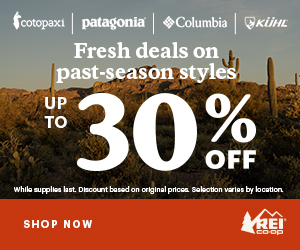 You won’t see random ads on my site that have no connection to the Camino. You will see an occasional Camino book, product, or my own designs linking to my Etsy shop. I don’t ask for donations like some Camino blogs do, but I do enjoy offering accessories for those who have embraced the Camino lifestyle.